← Low Self-Esteem? Get Inspired! The person you fell in Love with, does not love you. How can you cope? It is sheer emotional abandonment. Love unreturned causes you to feel lost and used. 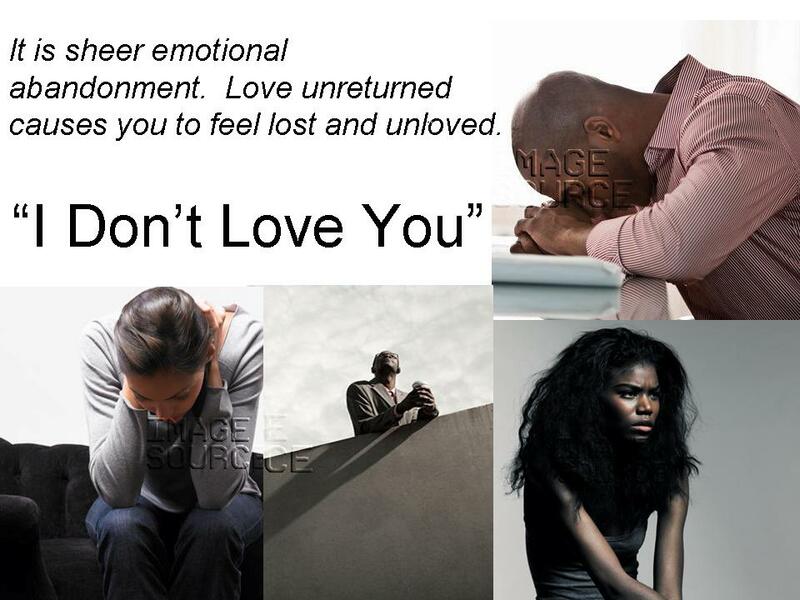 Hearing the words, “I do not Love you” puts you in a temporary state of denial and disbelief. This is a safety latch. It forces the brain to not have an immediate impact of truth in one emotional fatal blow. Quite often I read articles, blogs and posts on facebook where people are in pain because the man/woman they love has told them, they do not love them. Unrequited Love. The writings further express how they so love their unloving partner, and will wait for a change of heart. The sooner you accept the words, the better off you are with getting over this in a timely and less prolonged way. The more you deny what you’ve heard. The more you doubt the words, regardless of how contradictory you think they may be, the more you prolong your pain. The more delusional, the more you are setting yourself up for a huge let down. It matters not what that person comes back and says. What he/she originally said holds the most dominant sentiment. We always say things without thinking. We try to come back later and fix it, but we “primarily” mean what we say from the jump. Debate if you will, but things we say in anger we mean it. In that moment and time we meant it. We may soften up later, after considering the pain we spewed out, but in that moment of rage or anger something drove us to say what we said. No doubt about that. In some situations that person will create some distance, by not calling or faking out on a date, being unreachable, and you, believing he/she only needs space, are hoping for a change of heart. Do not deny the truth, but do allow them time. You also need space to deal with what you’ve heard. If you try to call, because you feel this is necessary and the call is not returned, protect yourself and do not call again. Do not beg someone to Love you. Do not beg for someone to retract. In asking for a retraction, you may get it, but only because you need it. It does not retract a change of heart. Take it with dignity. You will respect yourself later for it. Try not to waste your time thinking about this person. Try not to wait for a call. Try not to think around what you’ve been told. Give that person enough credit to know what they have said, was done so with intent. If it was not done with intent, you are dealing with a confused individual. If confusion is what you choose to have in your life, then you will be dealing with this reckless behavior again. Good luck with that. In a normal situation on this order, believe the words that have been spoken. Do not spend more time remembering the tender moments, as this will give you more pain, and you will love this person more. “I do not Love you” is what they have said to you. Focus on a new project. Do something you have been procrastinating on doing. Take this time to help someone. You need to place your energy of anger (yes anger) and pain in way that is more productive, rather than self damaging. Trust that person is moving on. All the while this person has not really thought about you, because if they had he/she would have reached out. If you were loved, you would be treated lovingly. If you were being loved you would not be in this painful situation. This person has you in this place intentionally, and without much consideration. If you are not trying to accept and move on in a tiny step, you are brooding and worst of all, hoping. Accept. Believe. Move on. Should that person call at any point, totally listen. Do not be so caught up in the possibility that this can be a sign of love. Listen to what he or she is saying. If you sense evasiveness, deal directly with the facts. Why not? If he/she is trying to change what has been said, challenge them to every degree possible. Most likely you will not be fully convinced of what they are trying to change, so allow your gut to speak to you. It is in your best interest to listen to your gut. If any person, whether with directness or subtlety, says there is no love in their heart for you—believe what you’ve been told. Otherwise, you set yourself up for pain. Be not deceived. Know this is only one person out of millions who does not deserve your love. You love him? You love her? And your love is being rejected? He/she never really loved you. You were most likely giving more in the relationship anyway. You deserve much better. Sure it hurts. You think that is the only person for you? If so, why are you being rejected? If this person was really for you, he/she would see the beauty of your Love. As scarce as true love is, he/she rejects it? Move on to a better place and choose to be with a better person. Take this time to strengthen your heart. Be confident there is someone who wants and desires your Love. You are so deserving of being loved in return. Spend your time and effort in healing. Rest assure that Love is not very far from you. It is definitely not in the arms of anyone who does not deserve your Love. This entry was posted in Fix Yourself and tagged how to deal with a loveless relationship, I don't love my partner, loveless relationship, partner does not love you. Bookmark the permalink.